I love artists, who perform on the street. Whether classical music, song, pop, paintings, acrobats, comedians, actors, living statues. I can watch them all and enthuse about a good performance. I admire the really good artists and feel sorry for the mediocre. I like watching and let myself by entertained and carried away. Then I’m generous, because a good performance should be rewarded and if someone succeeds in making me laugh, I also want to show my appreciation. There are highlights, like in June at Whitsun in Ascona with the Artisti di strada, who transform the piazza into numerous open-air stages. One can laugh, wonder and take part (very often against one’s will) from morning to late in the night. The artists come from the whole world and also provide world class performances. In London in Covent Garden there is also always something to admire with a wide range of opera music through to popular comedy. 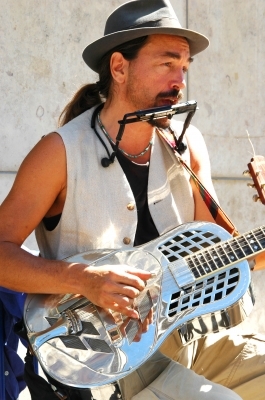 In Prague on the Altstadtplatz there is also entertainment to be found. Categories: My Blog | Tags: Artist, Artisti di strada, Musicians, Street musicians | Permalink.